You'll love the beachfront location of the Courtyard Virginia Beach Oceanfront/South. Located in the heart of BeachStreet USA, take advantage of this hotel's prime location in the center of the Virginia Beach boardwalk just steps from the waves and exciting events. Live Streaming Webcam Solutions provided by Vista Webcams. 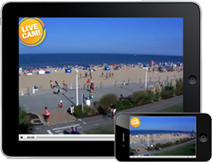 Use a live webcam to engage your audience, build up your web traffic, and give your social sites a boost.